Four skeletons - one of them headless - were found in February during an archaeological exhibition on Beacon Island, which forms part of the Abrolhos Islands, west of Geraldton. One of the darkest chapters of Australia's maritime history played out on the islands, following the shipwreck of the Dutch ship Batavia in 1629. The Dutch East India vessel was on its maiden voyage when it wrecked with more than 300 people on board. About 40 people drowned but the survivors managed to swim to nearby Beacon Island where mutiny and systematic murders took place. Over the past two months, specialists at the University of Western Australia's Centre for Forensic Science have been piecing together and stabilising the skeletons found on the tiny coral cay. Associate Professor Daniel Franklin said through the process, they have uncovered evidence there is probably more skeletons on the island to recover. 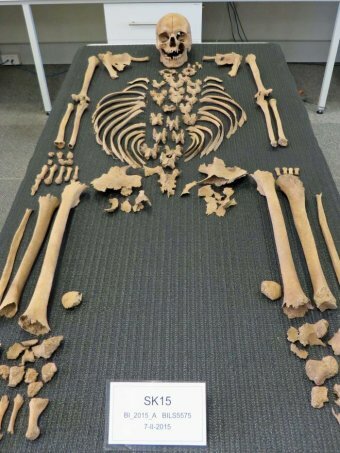 "I think, at this point, we may have another individual that we found some fragments of remains from in the same area," he said. "In particular, there's some teeth that we recovered and some other hand and foot bones that really don't look like they belong to any of the three new individuals that we recovered. The headless skeleton has been reunited with its skull which was found on the island in 1964.